Multiple National Finals Rodeo qualifier and RFD-TV’s 2018 The American Barrel Racing Champion, Taci Bettis, shares her tips to success. 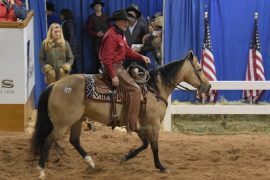 Barrel Horse News: What do you consider to be your keys to success? Taci Bettis: The time and the dedication I’ve put into it and the help I’ve had to get me to where I’m at today. I wouldn’t be able to do it without all of Tammy’s (Tammy Fischer) help that she gives me daily. My family’s help, I have a zoo at home, it takes a village for me to be able to just get up and leave and go rodeo. I really wouldn’t be able to do it without all of them. BHN: What has helped you master that mental game aspect of it? And, just don’t let the negative go into your brain, if the negative wants to come in start thinking about positives and kind of – not blowing it off, but do something else. Make it happen. I think that I’m really shy and so I let those things intimidate me and I use to let it get to me and now I’m overcoming it more. Just do it, you know just go out there and try it and if you gave it all you have there’s another chance. I’ve been reading a lot and Tammy has been there, done that and she’s always there to say ‘Quit. Don’t over think it, you’re overthinking it,’ and you do, when you get to thinking about so much you’re over thinking it instead of just feeling it and doing it. You’ve done it, you know. Just do it.